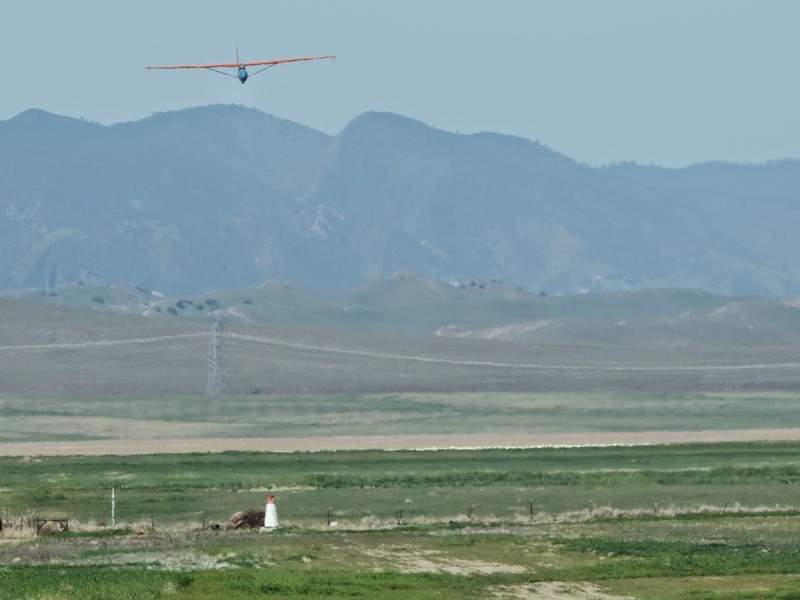 Central California Soaring Association: April 12, 2014. CONGRATULATIONS CARL ENGEL !! April 12, 2014. CONGRATULATIONS CARL ENGEL !! Max Lift: Early, nothing. Later, up to 10 kts. Comment: Nice turnout of members. No markers for easier thermal searching. Tow pilot: Andrew Ouellet. Thanks Andrew. It was a nice day. 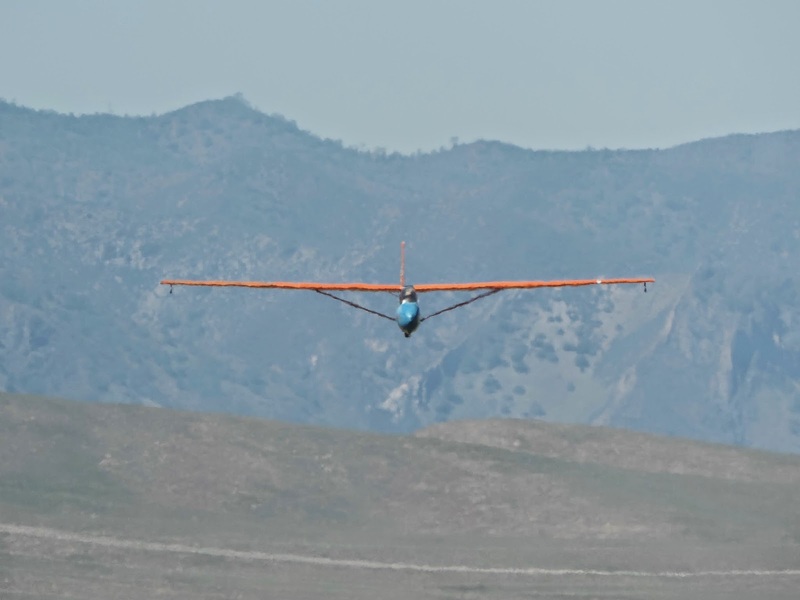 The wind wasn't strong enough from the southeast to move the gliders to the northwest end so things moved along nicely. A good day for a checkride. Dan Gudgel beginning the checkride for Carl Engel with a preflight. Dan in back holding the rudder during a Positive Control check. In just a minute they'll be ready to launch on the flight portion of the checkride. Carl on tow boxing the wake behind Andrew Ouellet doing the towing. Carl on final for runway 7 after a simulated rope break. 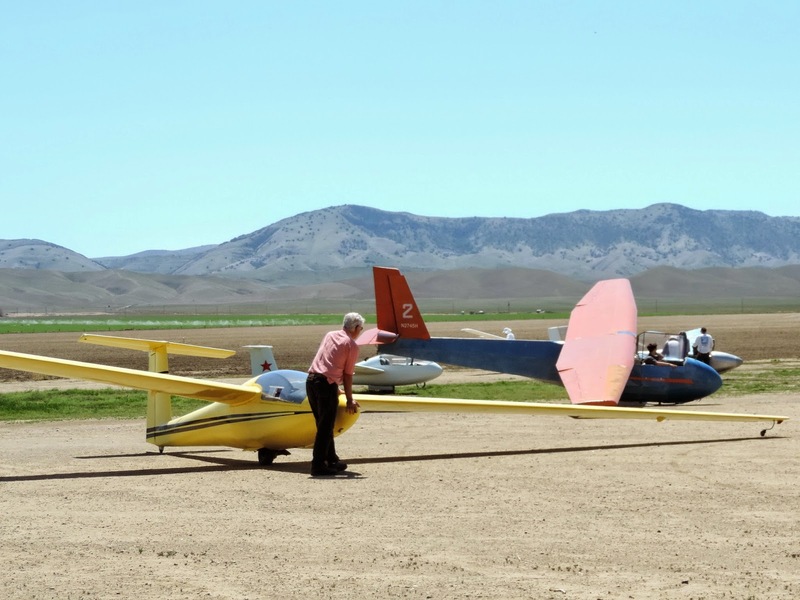 Last landing of the four checkride flights for Carl Engel. 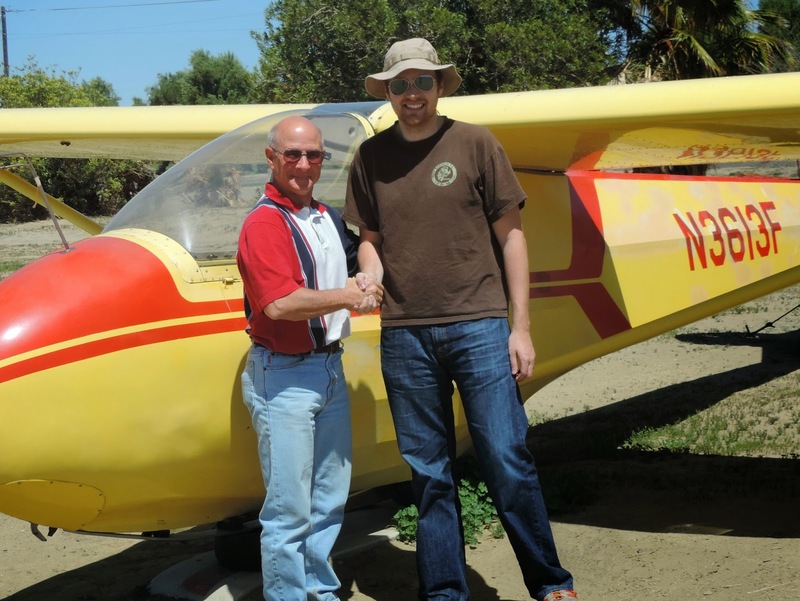 Dan Gudgel congratulating Carl Engel on passing his checkride. 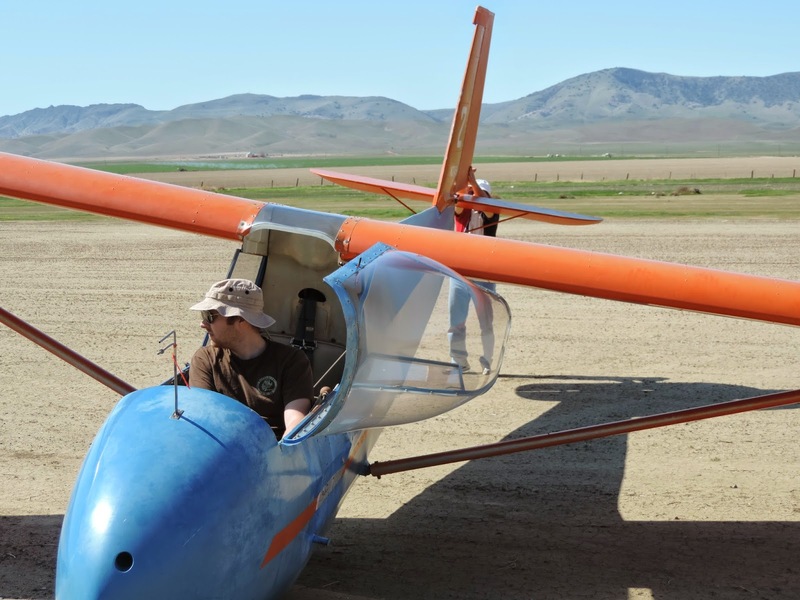 Carl Engel was awarded his Private Pilot's License in Gliders as an add-on rating to his Private Pilot's License in Helicopters. Congratulations from all of us to Carl. He did very well as commented by Dan Gudgel our celebrated examiner. We had a good turnout today. 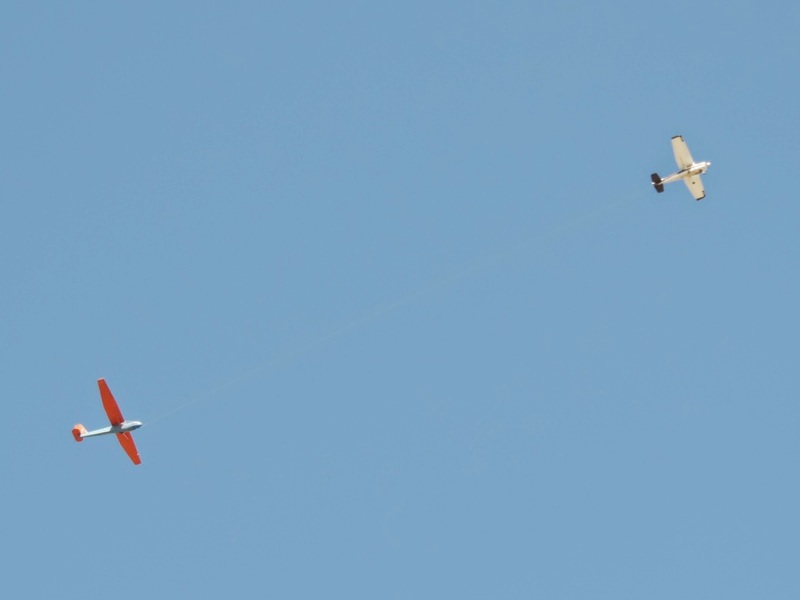 There were 11 pilots on the field and most went aloft. Ron Ronat and my son, Harold III, were also present but didn't fly. 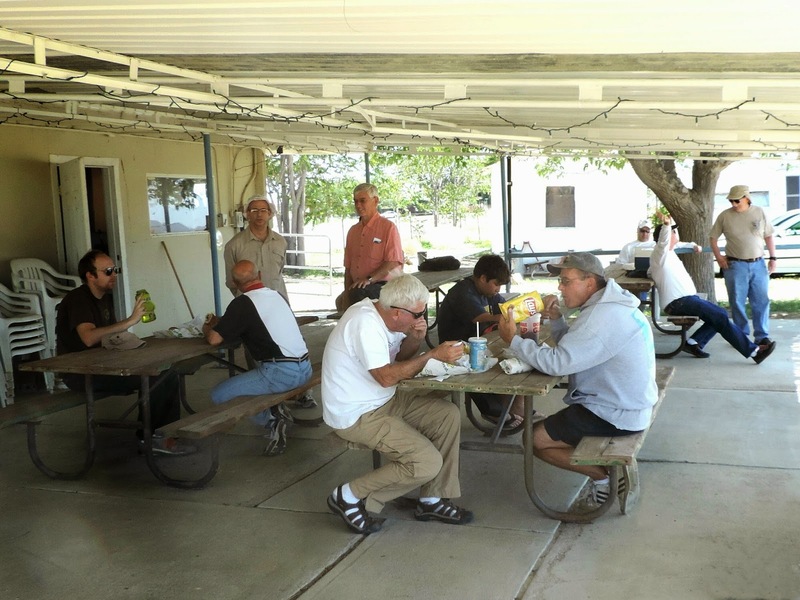 Otherwise we had a really good group who all took a break for lunch before launching in the warm afternoon. Nine of the eleven pilots here today are taking a lunch break. Karl Kunz launching in Golf Delta for an afternoon of fun. 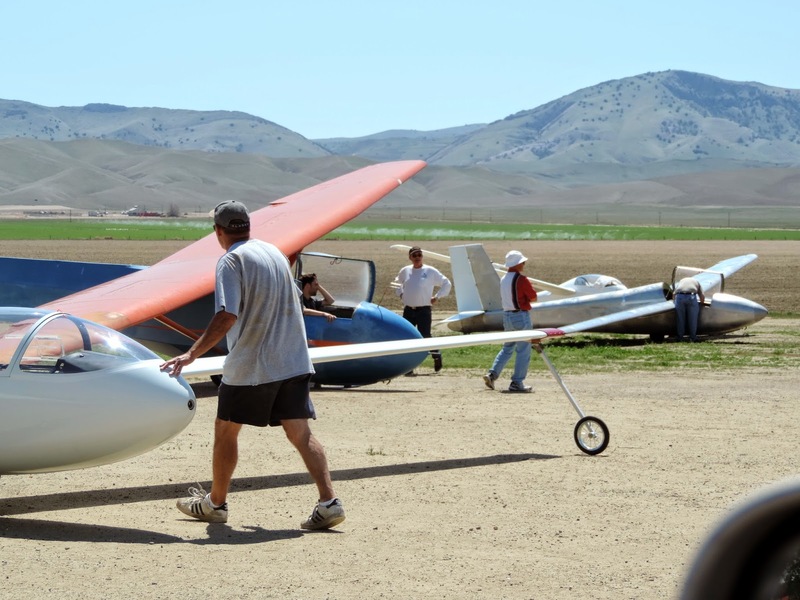 Ethan Ronat assembling his glider while Larry and Andy work on the Russia. Larry Johnson pushing his Russia to the line with all the others waiting for a tow. Only five shown but at times there were seven gliders in the queue. 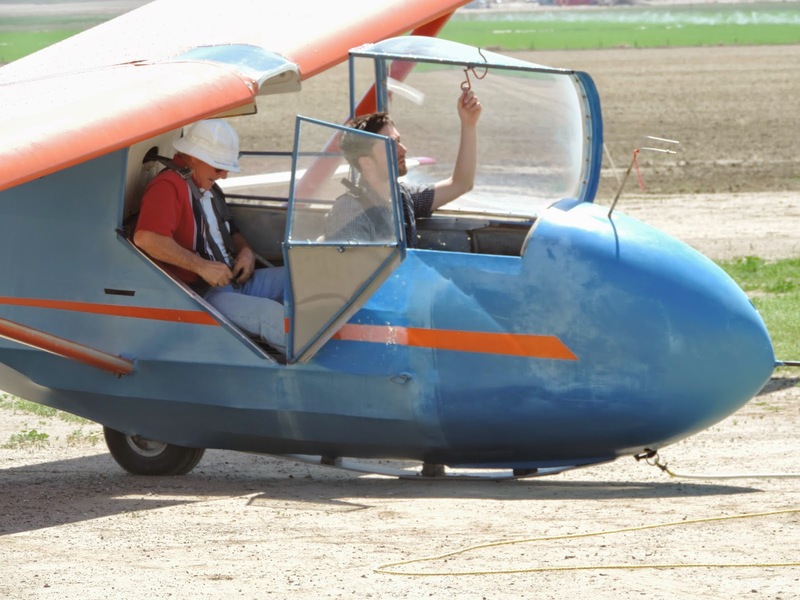 My first flight of this season, and it was time to get all the dust off the glider, and remove glider and personal rust. After checking out and discussing hanger options, I took my time with YH on assembly, checking, cleaning, etc. and launched shortly before 4 pm, for a local flight. Bit surprised at how strong it was, once able to reach the mountains - I got 10 knots of lift at times, and was up at 7000 ft., without staying to test how high it topped. 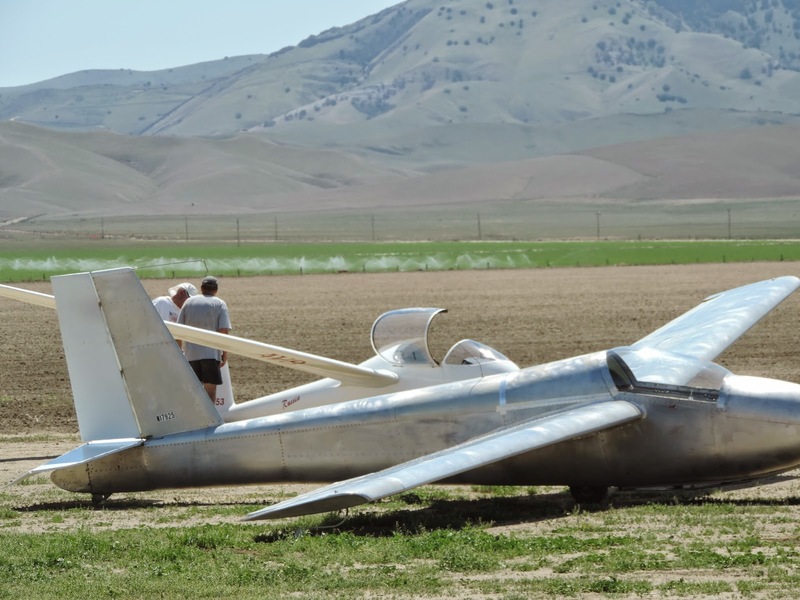 Probably still could have gone on a late afternoon X-country flight, but elected to land due to some prior engagement in Fresno. All in all, fun soaring, and a good appetizer for the coming season. Scattered thermals, tough staying up for an hour. Glad to be back in the Russia!! I had two flights in the 1-26 after Mike P was done with it. The first was a 3000' tow with a few bumps on the way up and almost none on the way down. I did manage to make a few turns in zero sink (I had to guess about the sink rate because the battery was recharging and the mechanical variometer was not working). The Second flight started out as the first, but this time there were bumps on the way down. After releasing, caught a nice ,but weak, thermal over Hwy 33 near the 31 end of the runway. Climbing in a steady, but uneven thermal, I made countless turns up to 5,800'. Feeling that I had reached the top, I headed west across the valley towards the hills. I made it to the foot hills at about 4000' and found break even lift/sink thermal that would keep me afloat. About that time 'Orange Crush' joined me in the thermal. We were at about 3300'. It was hard to tell, but it seems there was a weak convergence stretching across the valley (no vario....). If I were higher in a higher performance machine, I would have headed out to the bigger ridges to the west. All in all I had a great 1.3 hour flight, the best this year... so far! I did 4 x 500' simulated rope breaks for approach tuning. Hadn't been out in a few weeks - in maintenance mode. Very short flight. found lots of sink and not much lift till on downwind.The rest of my birthday went much better. 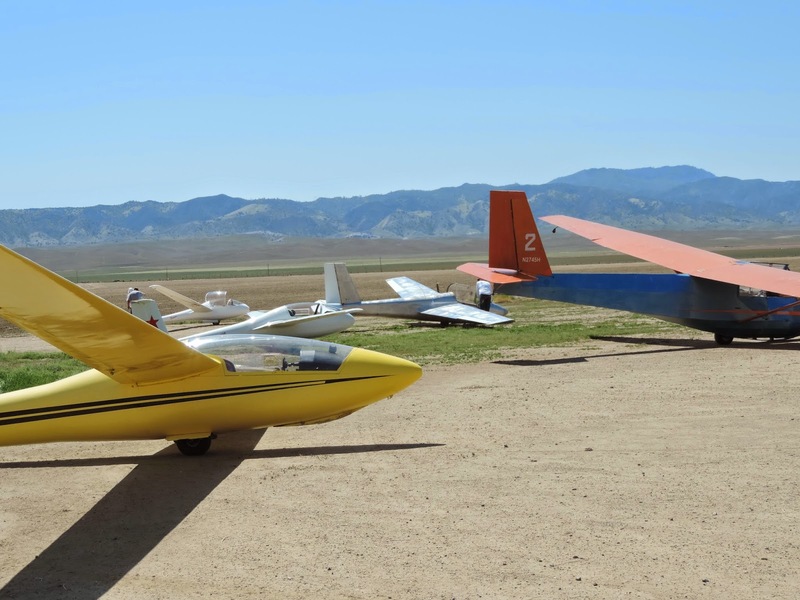 I got out late to the Gliderport after helping out at Young Eagles in Hanford. 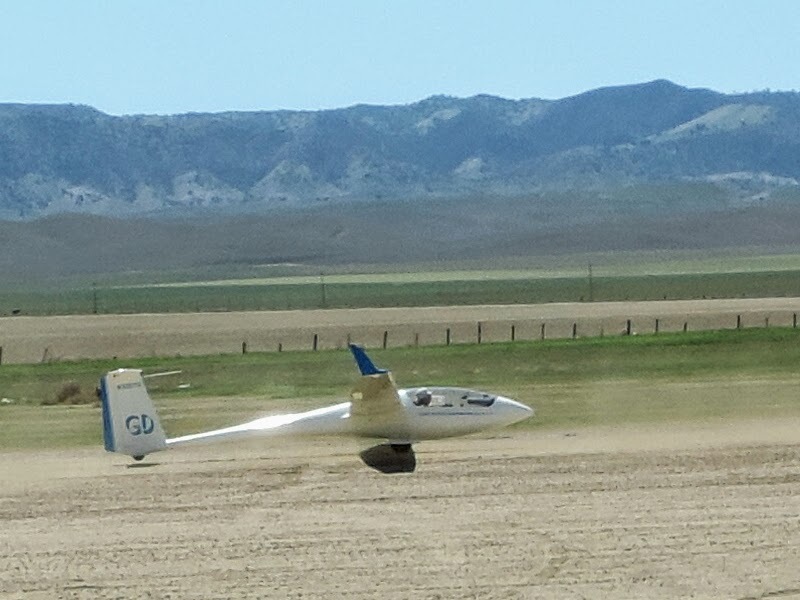 Got airborne in Orange Crush a little after 3:00, released at 3,000 AGL and found enough lift to basically maintain altitude for a while, staying within about ± 250 of release altitude for about 20 minutes. Seeing all the water in the fields I did not expect much lift over most of them. Worked along the dividing line between the farmed areas and the grazing lands going up to the hills, going northwest almost to the powerlines. By the end of the second northwest bound pass, I no longer found enough lift to stay in that area, so when straight true west of Avenal, head eastbound. Saw some dry fields north of my path back to Avenal, but if they did not give lift it would have been marginal to get to our preferred landing site. Saw a glass ship a mile or two south of me that was ascending as I was descending, but there was no guarantee I would find the lift when I got there, and without that guarantee, kept heading to the landing site of choice. Was able to stay in the 1800'-2100' MSL range a couple of miles west of the gliderport, but even that started weakening and harder to find the "up" escalators. The drift at pattern altitude would have indicated use runway 31, but the windsock was saying use 07. Since the tow plane was in front of its hangar, I had no expectations of better conditions later, and nobody else was scheduled, it was time to put Orange Crush in its tiedown spot, so I used 13. Did not get as close to the desired stop point as I had seen Dan Clark do several times before I took off, but still it was within Standards. Richard Walker positioning his Schweitzer 1-35 for launch. 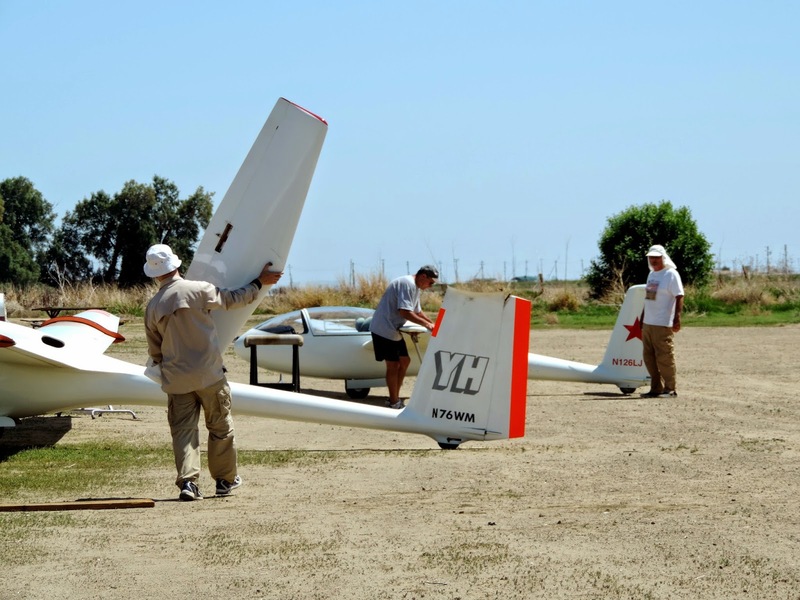 Five gliders ready for their pilots. 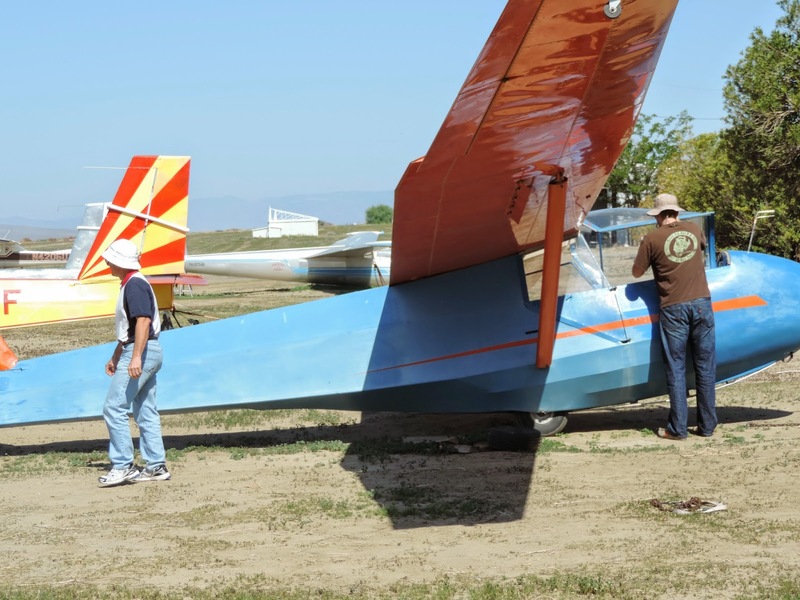 Larry Johnson and Andy Reistetter comparing notes on their Russia sailplanes. Daniel Clark and Dan Gudgel ready for another training flight. Down comes the canopy and slack goes out of the tow rope. Saturday April 5th. A "Painter's Sky".